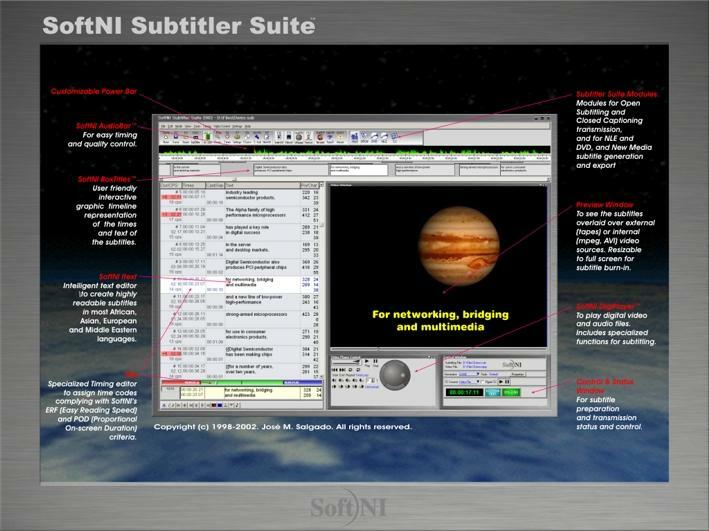 A revolutionary all-in-one subtitling solution, the SoftNI Subtitler Suite lets you rapidly create the highest-quality subtitles in most African, Asian, European and Middle Eastern languages. This powerful, versatile subtitling solution lets you prepare, format, time, review, export, encode and burn-in subtitles, using the leading high definition (HD) and digital (SD) character generators, professional video cards, closed caption/Teletext encoders, DVD and NLE systems, and multilingual cable/satellite transmission systems. All of these capabilities can be performed simultaneously from one single customizable and scaleable software package. Automatic assessment against SoftNI's research-based subtitling standards- ERF (Easy Reading Factor), POD (Proportional On-Screen Duration), and TRS (True Reading Speed)- ensure highest quality. Compatible with the most popular hardware, software and standards in the market, including Windows 2000 and XP, and standard Word txt and Unicode files. Supports subtitle preparation for all types of media and transmission systems, open subtitling, closed captioning (encoding and decoding), and DVD and NLE subtitling. Users can equip themselves with only the functionality they currently need, and upgrade at any time to any other configuration.